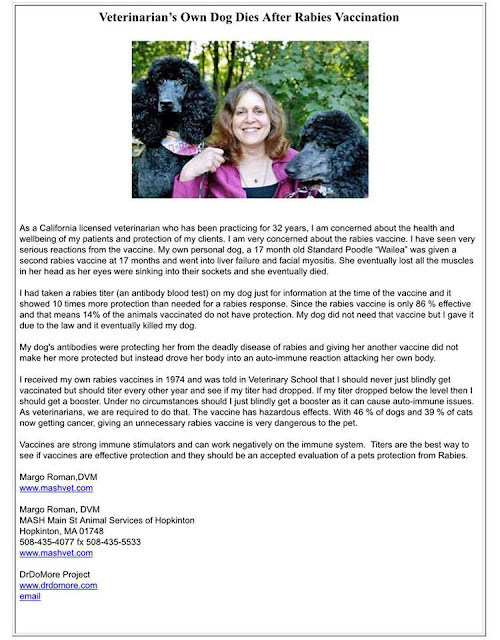 “… even a single dose of modified live virus (MLV) canine core vaccines [distemper, hepatitis and parvovirus] or MLV feline core vaccines [feline parvovirus, feline calicivirus and feline herpesvirus], when administered at 16 weeks or older, could provide long-term immunity [9 years or more] in a very high percentage of animals, while also increasing herd immunity. If you’re concerned that your dog or cat will develop a vaccine-related health problem, but you want to make sure they’re protected against disease, annual titers are an economical alternative. Measuring antibody titers is becoming common in practice­—but remains confusing, even controversial. Nosodes have been used in homeopathic medicine since the mid 1800s. Nosodes are relatively unknown in veterinary practice and very controversial in holistic veterinary practice. Many benefits have been noted, including a decrease in the severity and frequency of disease. Although nosodes are still controversial as a replacement for traditional vaccinations, evidence of their safety and efficacy is growing. Nosodes have been used in homeopathic medicine since the mid 1800s. Nosodes are relatively unknown in veterinary practice and somewhat controversial in holistic veterinary practice. Many benefits have been noted, including a decrease in the severity and frequency of disease. Although nosodes are still controversial as a replacement for traditional vaccinations, evidence of their safety and efficacy is growing. Can nosodes replace vaccines? 2 What we do know is nosodes are working with a degree of efficacy to warrant further study and data collection. We know that they are a safe alternative to vaccines, and that they have been proven for home prophylaxis in human clinical trials. Because of their safety record, health benefits, and even the lower cost, nosodes are gaining popularity among holistic veterinarians and pet owners who are willing to give them a serious chance. The natural deworming Diatomaceous Earth (often referred to as "DE") is an off white talc-like powder that is the fossilized remains of marine phytoplankton. When sprinkled on a bug that has an exoskeleton (such as bed bugs, ants or fleas) it compromises their waxy coating so that their innards turn into teeny tiny bug jerky. But it doesn't hurt mammals. We can eat it. We do eat it! It's in lots of grain based foods because lots of grains are stored with diatomaceous earth to keep the bugs from eating the grain! Dosage Food grade Diatomaceous Earth one teaspoon per day for small dogs and 1/2 teaspoon for puppies. For external parasite control, simply rub the powder at full strength into the coat for fleas and sprinkle on bedding.